LIGHTWEIGHT - Feels like you're not wearing glasses at all. ANTI-SCRATCH - Proprietary lens treatment offers superior scratch resistance. FIT - Medium or small adult face width. Good Asian fit. Well suited for a wide or flat bridge. Lens ARMORR. Scratch Protection formulated for MORR eyewear. Scratch ARMORR. (SA) is a permanent treatment that makes the surface of the lens 3 times harder than standard coatings without affecting optical clarity. Also eliminates "rainbow" lines you may have seen on other glasses you've used. Lens Design. 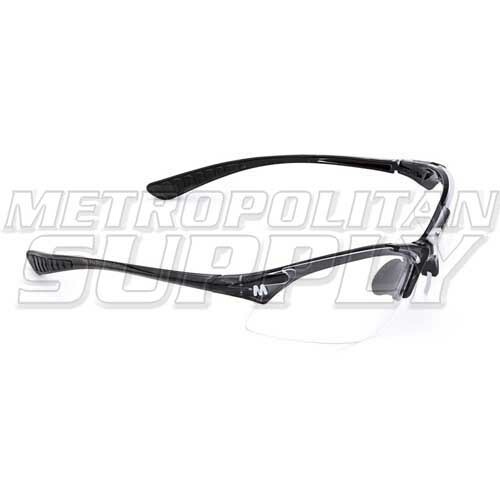 Blade-style for completely unobstructed peripheral vision in every direction. Great for minimizing your reaction time. Nose Pads. Ribbed hydrophilic rubber, hypoallergenic and replaceable. Non-slip nose pads and temple tips keep the glasses where they belong without uncomfortable pinching or pressure. Grip improves as you sweat.